Mori Lee offers a large selection of gorgeous and affordable bridal gowns for the modern bride. These gowns are well constructed and crafted from high quality materials to ensure a superb fit and tailored look. Any style or fit gown can be found in this amazing collection by award winning designer, Madeline Gardner. Whether you are a bride looking for a modern and trendy style or if you desire a more traditional and classic silhouette, Mori Lee is sure to have a gown that makes you feel like a princess on your big day! A-line gowns, ball gowns, fit and flare dresses, and mermaid style silhouettes are found in this spectacular collection. Slim and curvy brides can feel confident that they look their best on their wedding day when they choose a style from Mori Lee! From gorgeous satin to stunning lace wedding dresses, Mori Lee has it all! 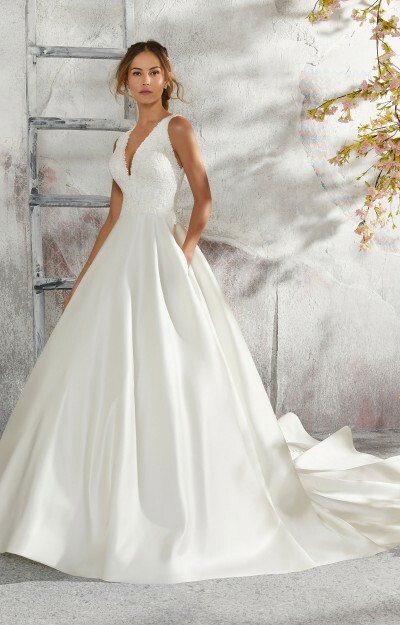 Offering sizes 0-32 as well as a plus size line, Mori Lee ensures that every bride can find a gown that makes all of her childhood dreams come true! Bridal gowns also come in both white and ivory and we would be happy to order the perfect gown for you. So many brides have already planned their fairytale wedding by starting with a beautiful Mori Lee design. Schedule an appointment with us today to find your perfect wedding gown! We can't wait to help you start planning your Happily Ever After!! We carry the Madeline Gardner lines Mori Lee prom dresses, and Mori Lee bridesmaid dresses too!